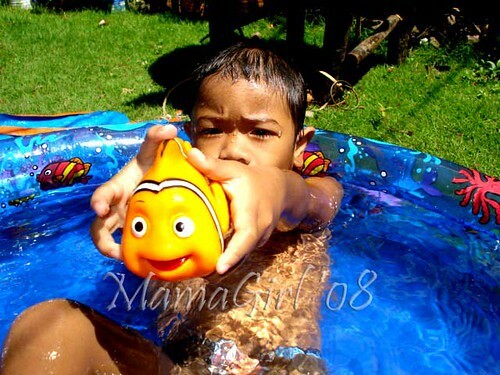 Wordless Wednesday #32: Nemo found! This is my first time to join Furry Friday and my entry is, er, not that furry but they are feathery! 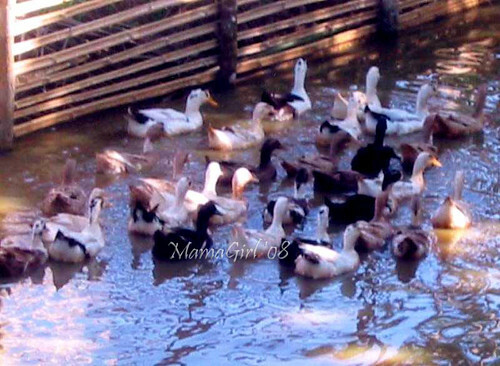 These ducks are raised in one of our demo-farms in the province of Capiz. Ducks are raised for food (eggs and meat) and their wastes are collected and used as organic fertilizers for rice and vegetable farmers. Demo-farms like this is one of our ways of reaching out marginals farmers in the remotest towns of Capiz and to show them how new farming and animal-raising techniques can help increase their productivity. 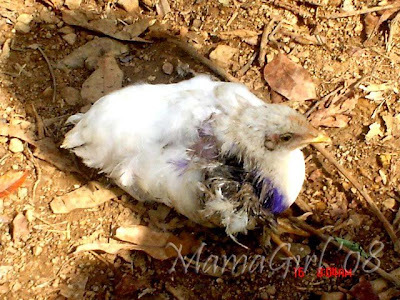 A number of poultry and livestock animals are also found in the demo farms, and, apart from ducks, it includes chickens, cows, pigs, buffaloes, goats. A farm technician assists the farmers. In one aspect of our project, we give a pair of poultry or livestock animals to our farmer-beneficiaries (who are victims of the recent Typhoon Frank) as a start-up and with the use of recommended techniques, make it grow. Once they have successfully raised the animals, they will pay back the organization the same number of animals given to them. ... swimming in the pool with my little boy. I heard his footsteps coming towards me and ushered me to where the chicken was. He had this serious concern on his face, seemingly unable to understand why a chicken was lying there wounded. Let's take the chicken to the hospital, he said, quick. That's my little boy, nurturing a soft spot in his heart for animals. 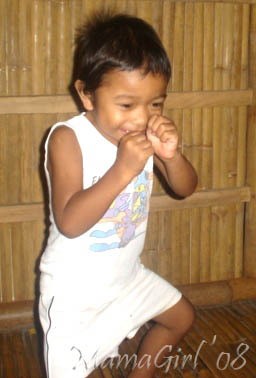 Move over Manny Pacquiao, here comes the little boxer Joshua. Come join us here for more Wordless fun. Do you wear eyeglasses? I do. I had it since I started working - can you imagine the numerous readings I have to do? I remember when I was younger, in high school specifically, when I used to study up to the wee hours, my mother would always remind us to stop for a while and give time for our eyes to rest. But then, because of the loads of readings in high school, my eyesight eventually got bad that I had to see an eye-doctor. He prescribed eyeglasses and my very first pair was made from a boring plastic material and cost a lot. Lucky are we nowadays because there are a lot of fashionable eyeglasses in the market. Take for example the Incredible Stylish New Frames From Zenni. Zenni optical has a large selection of prescription eyeglasses online. All of its eyeglasses have full UV protection, anti-scratch coating and many others. The eyeglasses are sleek and sassy, they have high quality with all the protection you need, and yet, very wallet-friendly. No wonder it's the brand that's preferred by most people in the US. And because of its every-growing popularity, Zenni Optical was on FOX news! Oh how I wish Zenni Optical $ 8 Rx Eyeglasses are available in the Philippines. We just finished our relief operations recently but donations, in cash or in kind, are still pouring in thanks to the kind people out there. We will collect them and schedule another relief operations as soon as we have sufficient supplies for our project beneficiaries on the other side of the province. So many people out there, project beneficiaries or not, needing food supplies and they could not go to markets as water level is reportedly still high. More Wordless photos are found here. As mentioned in my post just below, a very strong typhoon Frank hit the province of Capiz and its capital, Roxas City. The whole province and the rest of the Panay Island were caught unprepared because the typhoon unexpectedly changed its path and went straight to Panay Island and wreck havoc from where we are. 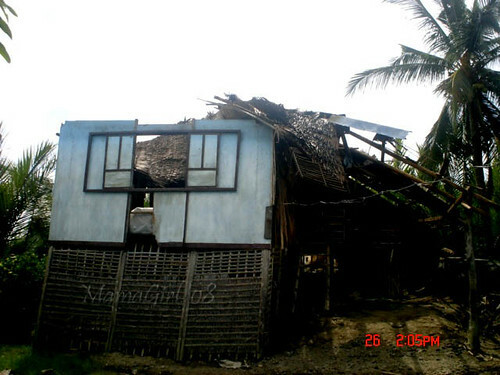 Damage to properties and infrastructures were estimated to amount to millions of pesos. 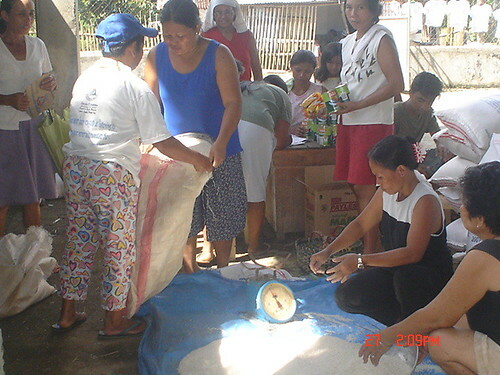 Our organization, the Katibyugan Inc., immediately prepared for a relief operation. 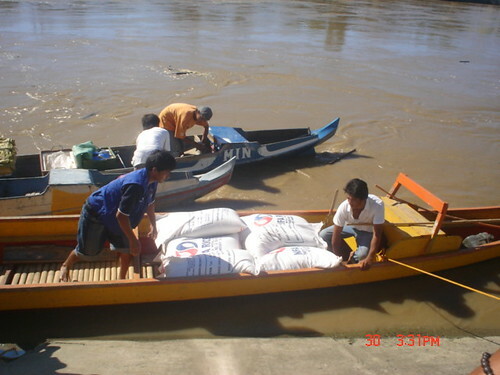 We targeted seven municipalities in Capiz with about 4800 families and started giving out relief goods since June 24. 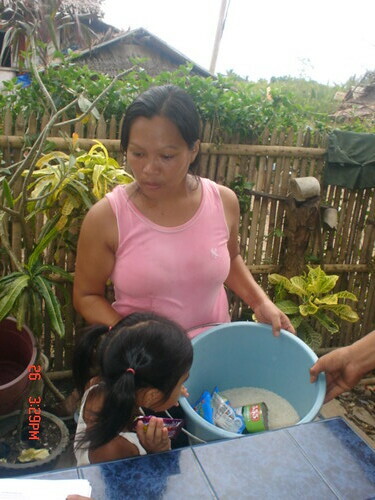 The packs consist of 5-10kgs of rice (depending on family size), 2 large cans of sardines, and packs of instant noodles. By any standard, the goods were not much but it's enough to tide the family over for one or two meals. So far in the seven municipalities, we have covered 29 barangays, plus a total of adopted barangays in the municipalities of Pontevedra, Panay and Sigma. 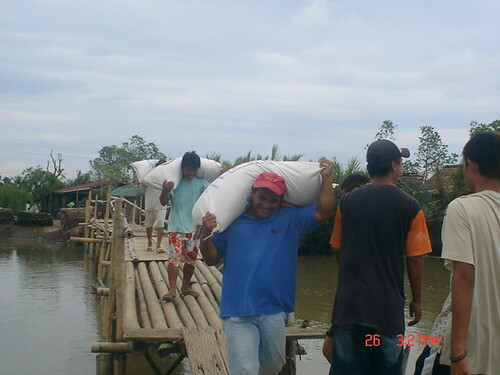 Here are some photos of our relief operations in Brgy. Amiligan, Pontevedra, Capiz. This barangay is a coastal area where most of the population rely on fishing and looking after fishponds. This barangay has a special place in my heart because we used to spend our summer holidays here with my elder sister, fishing and playing in the fishponds. It is sad to return there to see hundreds of houses flattened to the ground, the fishponds gone, and the sadness in the people's faces are clearly reflected in their eyes. If you are interested to donate or give assistance, there are still thousands more families needing your help. Kindly email me for more information. 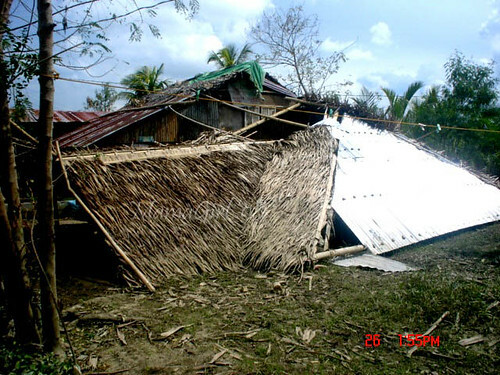 Some of the views after Typhoon frank hits the province on June 21, 2008. Most of the damage caused were houses, posts, rice fields, trees and areas flooded almost 5 municipalities.